Hosni Mubarak announced he was standing down as President of Egypt after a week of high charged and intensive riots across the nation. The protest, which has resulted in the deaths of some people and the deaths of many others, reached its peak today when the demonstrators announced that they intended to escalate the protest by creating a Facebook page protesting his regime and simultaneously removing their ‘like’ on his. Mr Mubarak had nearly 15 million likes on Facebook at the start of the week, largely due to Egyptian law requiring everyone with a Facebook group to like him; by mid day today, that figure had fallen below 1,000. It is believed that once Mr Mubarak saw such blatant disregard of his Facebook policy he realised it was time to stand down. He also praised the help that the Egyptian people had received from the 20 million Facebook American users who changed their Facebook status to a picture of the Pyramids. “To be honest, I didn't really get it at first. I thought all my friends were just posting pictures of their vacation, but then I remembered I live in a small town and most of my friends haven't even been out of state. 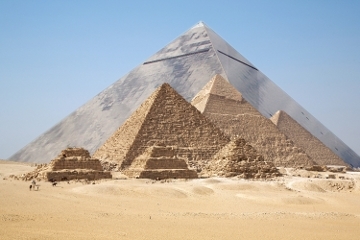 President Mubarak's offer to build a new super-pyramid using the same methods as the Egyptian Pharohs was not a welcomed solution to Egypt's unemployment problem. While the Egyptian situation has been lauded as a success for social networking websites, it has been detrimental for other online businesses. Expedia shares plummeted following news that many users of the website have surrounded their offices demanding regime change at the holiday booking website. “This is the last time I use Expedia,” holiday maker Keith Wilson announced on his favourite Internet forum, “The hotel, recommended to me by Expedia, had a 5 star review; but when I went to grab an early morning swim there was a burnt out car in the pool. “I was prepared to let that go, but when I then went to have breakfast nothing had been prepared. In fact, no one was serving food anywhere in Cairo. The streets were crowded. “I tried to emailed Expedia from my iPhone to express my dissatisfaction, but I could not connect to the Internet. It was outrageous... Expedia had assured me that I could get Internet in Egypt. While so far the spate of riots have all been taking place in the Middle East, some analysts are speculating that the next social networking protest will take place in Italy against Italian Prime Minister Silvio Berlusconi when all Italian females under the age of 21 delete their OK Cupid and MySpace accounts.